We’re not sure where this little dachshund figurine came from but it sure is cute! These are often attributed to Bosse but are NOT made by him. Though he did work with un-patinated polished brass it was mostly early in his career. It took quite a bit more finishing work to get a high-shine finish. Working with black patina over brass and picking your highlights was actually an easier process and would hide casting issues much more easily. This is another item we wouldn’t necessarily deem a fake but more of a similarly modernist styled item. We’ve seen this dachshund pop up mostly around Europe and Austria so it was most likely another Austrian maker working in the same period of the 60s. This little guy works as a bottle opener and knife/spoon rest and is always unmarked. It’s also pretty common and would bring about $35-$45 depending on condition. 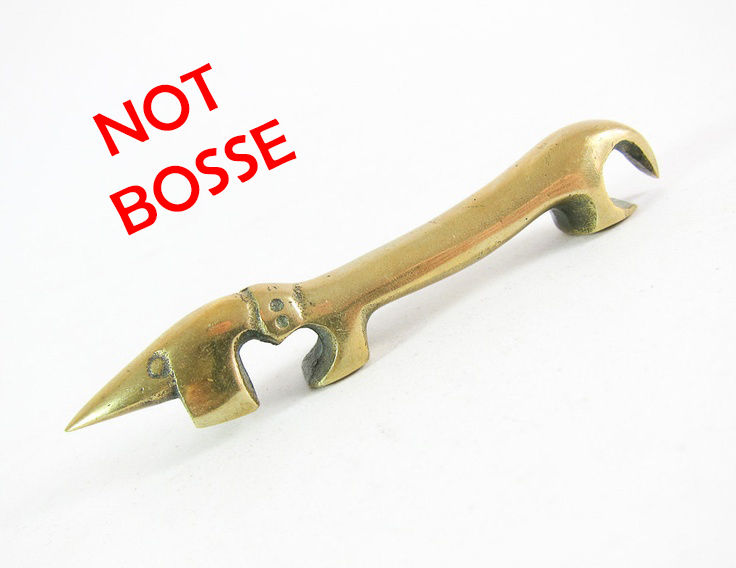 This entry was posted in Bosse Blog and tagged bottle opener, fake, knife rest, real vs. fake, vintage dachshund, Walter Bosse, walter bosse fake. Bookmark the permalink.